I made this card some time back, so I don't really have a list of supplies for it. 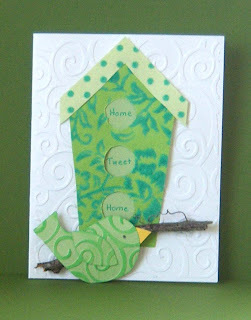 Obviously, I used the Cuttlebug Swirls Embossing Folder on the card and bird. I got the birdhouse pattern from Paper Crafts Magazine, and I believe the bird template was from them as well. The fun part was the stick (from my back yard) for the birdie to sit on. So cute Esther! Once again, you are so creative!!! Keep up the "card making." Very cute! Glad you joined us with Be Inspired this week! Great card. I like the green color. hi esther...this is SO cute! TFS! and Thanks for playing along this week at the cuttlebug challenge blog!